Yellow circle around a mechanism screw on a Powell Sonaré 601. Rachel told us that this is an easy fix. You can get a small "eyeglass screwdriver kit" and use the screwdriver to turn the screw back in place. As you'll see from the video, she holds the key steady, braces the screwdriver against her thumb, and then screws in the screw! It doesn't go in very far, and she told us that you'll feel when it's tightly in place. However -- a word of caution. As soon as a screw backs out, Rachel says you should call your repair technician and make an appointment. She told us, "If a screw backs out, there's a reason for it." In fact, it is the sign of a problem that should be addressed by the technician. Rachel says that screws back out because something is preventing the key from turning freely on the mechanism. It could be a few things, like too much key oil that has gotten "gooped up" in the tubing or some kind of bend or snag in either the mechanism tubing or inner steel. If a student accidentally bumps his/her flute against something like a stand or drops the flute, it could bend the mechanism tubing and/or steel. This causes "drag" in the key that might not be noticeable by the player, but as s/he continues to play, the motion will push the screw out. So, don't be afraid to carefully screw the backed out screw into place -- for now. 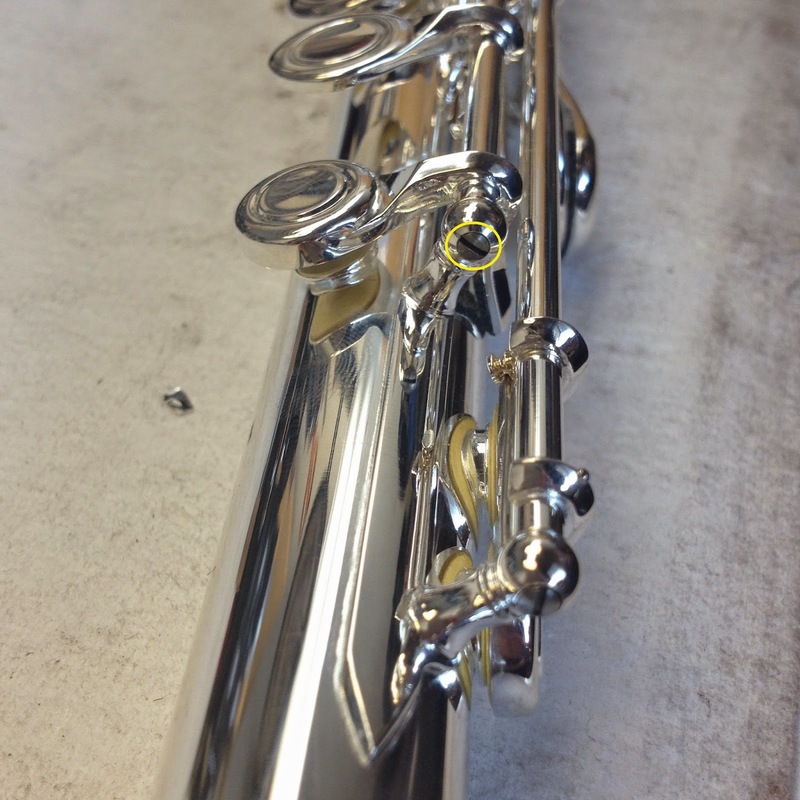 When you take your flute to the repair technician, s/he will be able to smooth out any snags (literally and figuratively), and you should be all set!